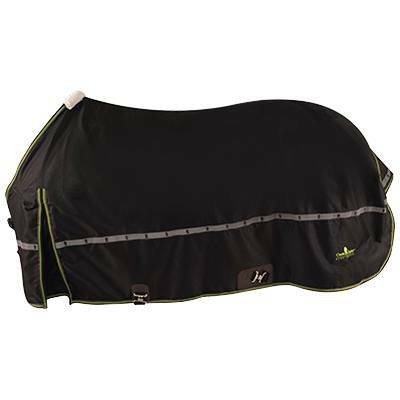 The Classic Equine Windbreaker™ Light Weight Turnout Sheet offers a 1200 denier breathable ripstop outer shell that is waterproof and extremely durable. Benefits of the Windbreaker include a nylon lining that polishes the coat, sturdy snaps and adjustable straps will keep the sheet in place. A contoured design helps keep the sheet in place while eliminating pressure points and fitted shoulder darts help eliminate rubbing. Adjustable nylon leg straps are replaceable and the reflective Knight Vision™ safety strip maximizes visibility in low light situations. An all around sheet for any horse!